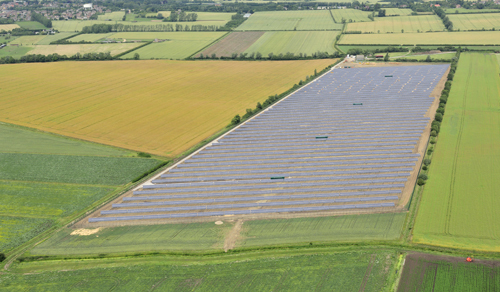 The wider Cambridgeshire area is already home to some of the country's largest solar farms. Huntingdonshire District Council is to prioritise solar over onshore wind developments as it seeks to bolster renewables in the area. The council set its stall out for new renewables in a consultation draft of its 20136 local plan, published earlier this month, which details its infrastructure development plans over the course of the next 20 years. It cited the wider Cambridgeshire Renewables Infrastructure Framework as having demonstrated significant potential for renewable energy generation in the district, but stressed that the council’s intention would be to limit this to technologies other than onshore wind. The perception within the council is that onshore wind farms are too visually intrusive and noisy to gain public support, while solar farms and other renewables such as combined heat and power would be weighed against their benefits. This policy, the council notes, is intended to “encourage appropriate schemes whilst ensuring that the risk of adverse impacts are properly addressed”. Huntingdonshire has paid particular reference to the large number of former Ministry of Defence sites within the district as possible locations for these developments, highlighting the opportunity for renewables to be focused on previously developed land rather than agricultural land. Ex-military sites have proven to be popular with solar developers. A large number of former RAF airfields now house utility-scale solar farms with others also at various stages of planning. The largest solar farm in the UK – the 69MW project at DTTC Lyneham – is built on land that used to house an airfield and is now the site of a military training centre. However developers eyeing Huntingdonshire may face a squeeze when negotiating grid connection agreements with the area’s distribution network operator UK Power Networks. 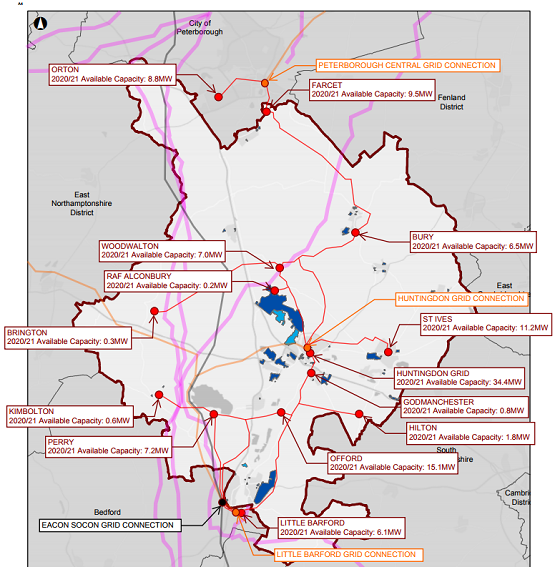 An accompanying document to the local plan includes a map of the area’s 33kV and 132kV networks, listing both substations and their available capacity without reinforcement works out to 2020/21. The below map shows a total of just less than 110MW of available capacity between the district’s 14 substations, with some areas offering just 200kW of available capacity.